A consumer search behavior model (SBM) is a data-driven process (Advanced Keyword Research) for classifying consumer behavior for each search query to a specific source, type or subject. It’s a reflection of the total consumer buying behavior experience for products and services in any single market segment, and should be one of the very first task executed during a product development cycle. What Does a SBM do? Consumer Search Behavior models helps you define your information architecture, focus your content strategy and identify landing page opportunities. Consumer Behavior Models are important! Statistically Valid – SBMs are statistically valid because of the extraordinary search volume (up to hundreds of millions) associated with a single dataset of 800 keyword phrases. Complete Experience – It provides insight into the total search experience. A single keyword phrase does not exist in isolation. Consumers execute a series of searches when buying products and services. Identify Important Traffic – Classifying consumer search behavior allows you to identify and order categories of search traffic that are most important to you. Micro-site Opportunities – SBMs reveal landing page opportunities where you can provide content that is an exact query match for consumer searches. One of the most common reasons that consumers bail out on a website is that they do not see an exact match of the terms in their search query at your website. Normalize Website with Consumer Intent – SBMs reveal exactly how consumers search for your products and services, which allows you to develop web and ad copy that exactly mirrors consumer intent. Content Strategies – Categories provide topical themes that provide a solid basis for organizing content and information architecture. Editorial Focus – SBMs provide editorial focus for content opportunities that may not be apparent at first glance – of course, content is what search is all about. Identify Preferred Terminology – SBMs provide insight into the most valuable terms most often used to modify consumer search queries. In most search behavior models the top 25 terms appear in over 80% of the search traffic. These 25 terms provide a very focused textual pallet for website and ad copy. Synonyms – SBMs identify terms that are used interchangeably by consumers. They often use anywhere from 3 to 6 different words to describe a single concept. It’s worth understanding this relationship and what the preferred terms are in consumer search. Human Factors – People search differently, and can express a single concept in two or more ways. This is not surprising – it reflects how an individual was educated, where they live, how old they are and how good their research skills are. You often see these differences in a search behavior model. Consumer Awareness – The lack of the branded searches in a market segment indicates low consumer awareness for that markets products and services. Contrasting Behavior Models – Each keyword phrase has a unique history of consumer behavior associated with it. For example, the phrases Search Engine Optimization and SEO do not have the same category footprint. For example, search volumes for most of the categories in these two groups are vastly different, and the keyword phrases in the categories are also different. The two SBMs are complementary, but there are significant data differences. 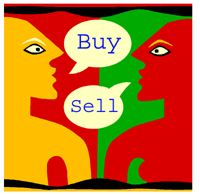 Related Models – If you are in a business where synonyms can be used to search for your products and services, you will find depending upon which phrase you start with, they will have a different behavior model. In this lawyer versus law firm model you can see how this works. Location-Based – If there are large numbers of the location-based searches in your data set, you should pay attention to whether they are using cities or states to modify search queries. Usually, one will dominate. The ratio of location-based searches to the total search volume will provide a good indicator of how much time and effort you should invest in your local SEO strategy. Compound Queries – Many categories are populated with compound queries. For example, the query Antique Car Insurance Boston is actually asking two questions. They are looking for a Type in a Location. These two questions should be reflected in website copy. Also, compound queries can be classified to two separate behavior categories. Complementary Categories – Certain categories can be very complementary, and can be combined to produce logical landing pages with very focused content as in this behavior model. Sub-Categories – There are always two or three categories that have many sub-categories with very focused consumer intent. These provide a development opportunity to construct custom landing pages or micro-sites that mirror this intent. The Type category is often a great source of this opportunity. The Interactive Agency behavior model illustrates this nicely. Value-Quality Trade Offs – There is always an interesting dynamic between value-based searches, and quality-based searches. This relationship differs from model to model. It’s worth knowing which behavior a consumer values most. The contrast of these two behavior models in the restaurant business shows this dynamic. Trending – A search behavior model reflects past consumer behavior over a one year period. It’s a good indicator, but it does not necessarily reflect shifting consumer attitudes in the future. The model should be revisited every six months to look at volume trends in each category, or to see if a new category has emerged. Product Requirements – Search behavior models provide extraordinary focus, and should be the first task done when developing a set of business and product requirements for new services. Content Strategy – The search behavior model should be one of the primary variables in developing and deploying content. Here you can find a good example of how to develop a content strategy based upon the data taken from a behavior model. 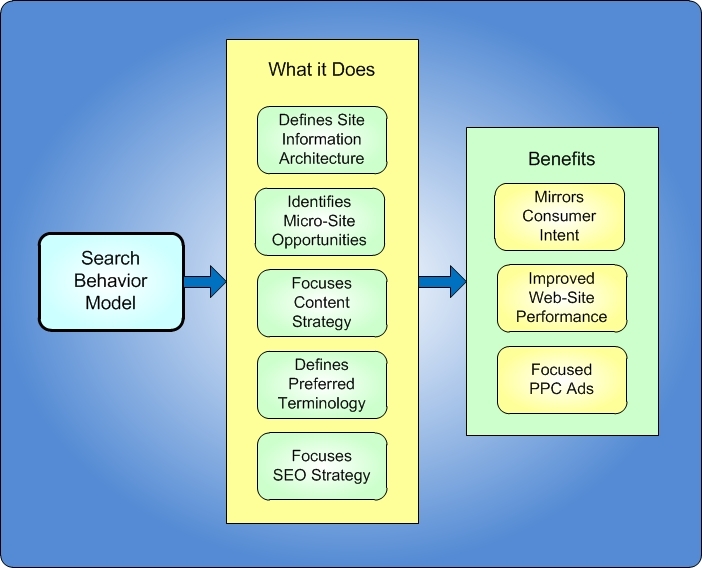 Information Architecture – Search behavior models should drive your website information architecture. SEO Strategy – The data in a search behavior model will guide your SEO strategy. No amount of SEO will compensate for not understanding your customers search behavior. Global Application – Consumers are taking their Google search skills and bringing them to the enterprise. They are also using the same search techniques in Facebook and other social communities. The insight gleaned from a search behavior model can be used to govern the management of your company’s Facebook page, or other social communities that you may sponsor. Regardless of your business, the results show you how these analyses will have a positive impact on your website’s information architecture. Browse through these – some of these analysis may be of interest to you. Restaurant Industry: A two-part analysis about how consumers search for a restaurant. Part I is a high-level look at the industry – Part II is more focused dealing with Family Restaurants. Hardware and Building Supply (i.e. Home Depot): A two-part analysis about how consumers search for products and services for remodeling projects. Part II deals with how to use Faceted Search to exploit the consumer behavior identified in Part I.
Non-Profits: An analysis about Multiple Sclerosis, but the insights are applicable to all Non-Profit organizations. Legal: This analysis contrasts consumers who search for a Law Firm vs. an individual Lawyer. Medical: This analysis is specific to a single medical practice. Interested in developing a custom behavior model for your business? Please get in touch to discuss your needs. Of course, I can also help you with your Social Media strategies, as well as nuts and bolts website improvements in areas such as Local Search, SEO, Mobile and Information Architecture.